Now you can join smart, eco-chic women who are changing their world, one gorgeous Zoya Nail Polish bottle at a time! 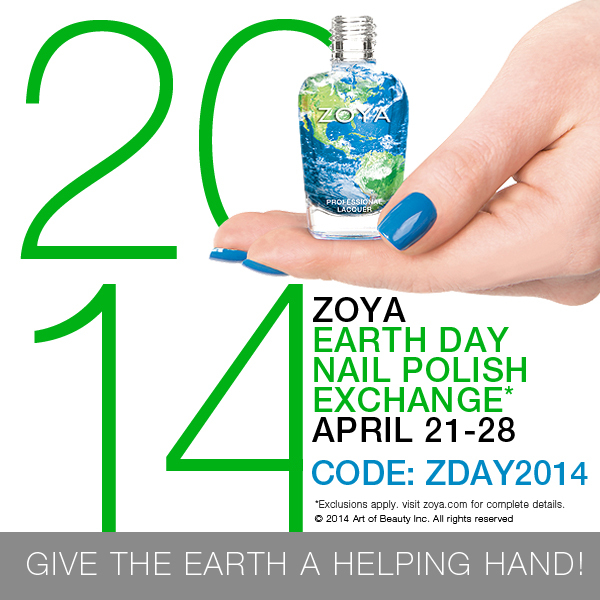 To help kick start your "color cleanse", the Zoya Earth Day Nail Polish Exchange is BACK for 2014. Not only is ZOYA making it easy to swap out old, unwanted color for the world's healthiest and longest wearing natural nail polish formula on the market, we will dispose of your old shades in an eco-friendly manner! This offer is only good for 1 week - so hurry - Don't Wait! PLEASE VISIT THE ZOYA BLOG FOR COMPLETE PROGRAM DETAILS!